Members of the Fayette County Commission at the March 28 meeting included, from left, commissioners Eric Maxwell and Edge Gibbons, Chairman Randy Ognio and commissioners Chuck Oddo and Charles Rousseau. Photo/Ben Nelms. A discussion of a conceptual plan by Fayetteville asking to use a 24-foot strip on the west side of the Fayette County Library parking lot to establish a connecting street adjacent to the new City Hall and park space project met with some opposition from Fayette County commissioners on March 28. Fayetteville Downtown Development Director Brian Wismer. Photo/Ben Nelms. 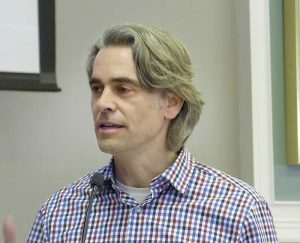 A move to continue discussions between the city and county, after some on the board expressed hesitancy about the concept, was essentially negated after the meeting, with Fayetteville Downtown Development Director Brian Wismer saying the city would no longer pursue the matter with the county and would find another way to establish the interconnecting street. The city is currently developing plans for the new city center that will include a new City Hall along Stonewall Avenue and several acres of park space and amenities to the south. The idea of establishing a grid street system through the City Hall and park space property to provide multiple entry and exit points led to a presentation by Wismer at the March 28 meeting to discuss the concept of the city and county entering into an intergovernmental agreement that would have the city using a 24-foot strip, running north to south, on the library’s west side parking lot to help establish one of those connector streets. The connector street on the east side of the new city property would intersect with Heritage Parkway, which runs between the library and county complex. 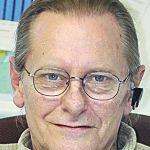 Given that the idea was conceptual, Wismer said he would continue speaking the library and county staff about the proposal, and explaining that the idea was to use existing impervious surface for the proposed street. Wismer said having the street positioned as proposed would help preserve the old barn structure that otherwise might be compromised if the positioning of the new street was too tight. Fayette County Commissioner Eric Maxwell. File photo. First up to speak on the concept was Commissioner Eric Maxwell, who said he did not like the apartments recently approved by the city that would be situated to the south of the new city park space. “I don’t think anybody heard me,” Maxwell said of the opinion he offered the city when the proposal by Walton Communities was being considered. Commissioner Chuck Oddo in his comments said he hoped that the planned interior grid system of streets could avoid having traffic able to access Grady Avenue or Beauregard Boulevard. The conceptual proposal at the meeting was left with the parties expected to continue the conversation, but that posture changed soon after the meeting. 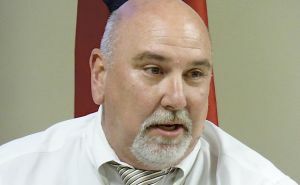 “We will find another way to accommodate the connection on city property,” Wismer said. A concept proposal by Pinewood Forest to complete the loop of its sidewalk and path system around the 235-acre property by having approximately 100 feet of sidewalk constructed on county right-of-way along Hood Road ended with Pinewood Forest after the meeting saying it would reconfigure the sidewalk to keep it off the county right-of-way. The agenda item at the March 28 meeting of the Fayette County Commission asked that Pinewood Forest be allowed to construct and maintain approximately 100 feet of the 500-foot section of sidewalk on Pinewood Forest’s south side due to topographical constraints on the development’s property. That 100-foot area is situated in the Hood Road right-of-way and led to the concept request. 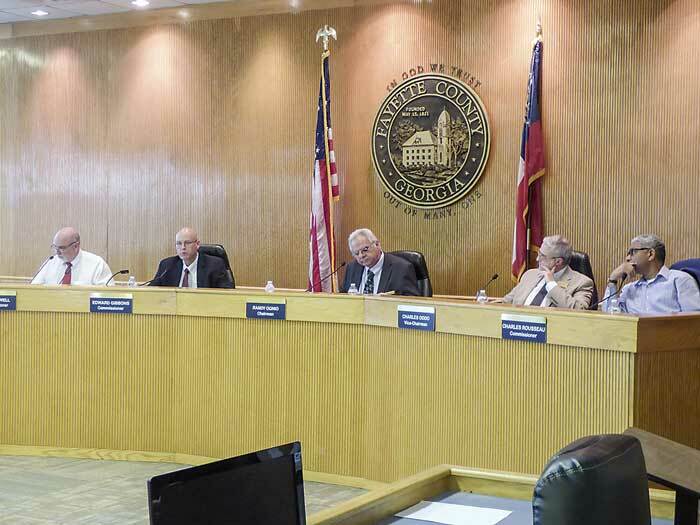 Issues surfaced during the discussion about the need to explore the the proposal, with an uncertain time frame that the proposal could be considered by commissioners. The discussion led to a 5-0 vote to have the concept reviewed and to have a staff recommendation. Pinewood Forest the following day opted to go another route, and will not pursue the proposal. “We’ve managed a way to keep the sidewalk off the right-of-way,” Pinewood Forest representative Rick Halbert said on March 29. Pinewood Forest has approximately 15 miles of sidewalk and path system on the 235-acre property along Veterans Parkway and Hood Road, with numerous walking and running events planned. A request to rezone 29 acres along Dogwood Trail for 16 residential lots received unanimous approved March 28 from the Fayette County Commission. Property owner Jacky Matthews requested that 28.99 acres on Dogwood Trail near Tyrone Road be rezoned from A-R (agricultural residential) to R-50 to accommodate 16 one-acre lots. It was noted during the discussion that up to approximately 25 percent of the property is in a floodplain and cannot be developed. County planning staff and planning commissioners recommended approval. It was noted that the rezoning request conformed to the Fayette County Comprehensive Plan. Commissioners approved the request by unanimous vote.